Doug Flutie is a player who has seemed to have an amazing amount of luck and heart follow him to every stop along the way in football. A heartwarming story, Flutie was considered well undersized to be a quarterback in the NFL after a storied career at Boston College where he threw a hail mary against the University of Miami in 1984 and won the Heisman Trophy that year. Originally drafted by the Los Angeles Rams in the 11th round of the NFL draft, Flutie opted to sign on with the USFL’s New Jersey Generals. In 1986 he signed with the Chicago Bears and then was on board with the Patriots, where got the starting duty in 1988. Unable to keep the starting job he was cut in 1990 where he signed with the British Columbia Lions of the CFL in 1990. The wide open fields of the CFL allowed Flutie to flourish and polish his game. Doug was a quarterback who kept teams honest with his feet and was an avid scrambler. 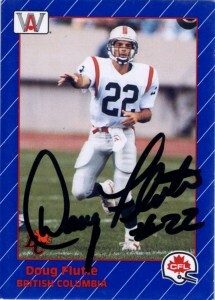 Flutie became the ‘Michael Jordan’ of the CFL, setting the record for yards in a season with 6619 yards, touchdowns with 48, and was named the most outstanding player of the CFL a record 6 times. Doug won the Grey Cup MVP with the Calgary Stampeders and Toronto Argonauts (twice and back to back). Returning with a vengeance to the NFL in 1998 to the Buffalo Bills, he was named comeback player of the year and took the team to the playoffs and named to the Pro Bowl, but Doug didn’t ever win the respect of management, as he was replaced by de facto starter Rob Johnson, who had returned from a season long injury. The quarterback controversy continued well into 1999, where Doug went 4-1 and Johnson went 4-7. In 2000, Doug was unceremoniously cut by the Bills and signed with the Chargers in 2001, who were reeling from the Ryan Leaf days. He would stay on board to tutor a young Drew Brees when he was drafted in 2002 and played sparingly for the team through 2005. With gas still in the tank, Flutie signed with the New England Patriots in 2005 to back up Tom Brady and retired at the beginning of the 2006 preseason. Flutie has a variety of age related records to his accomplishment, and was the first player to drop kick an extra point since 1941. 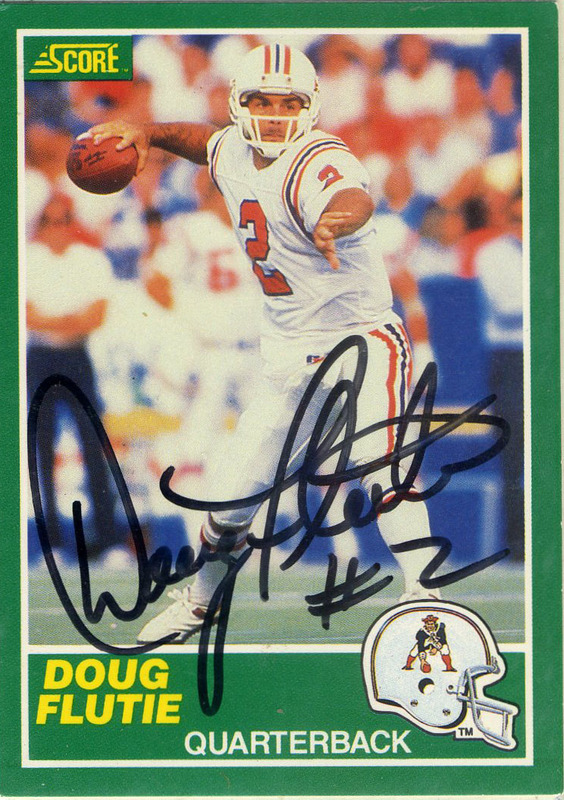 Although Doug did not find lasting success in the NFL, he has been enshrined into the CFL HoF, the Canadian Sports Hall of Fame, and the College Football Hall of Fame. He stays active playing basketball, and sponsors his own brand of breakfast cereal “Flutie Flakes” with the proceeds going to charities dealing in autism. 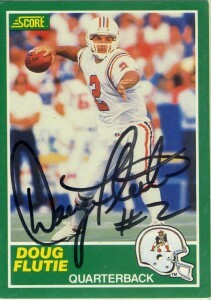 Doug also plays drums for his family’s band, the “Flutie Brothers Band”. Doug is an excellent commentator and also handled color commentary for the United Football League games.